Late last night, President Obama signed into law the Sean and David Goldman International Child Abduction Prevention and Return Act (P.L. 113-150). At this time, all of us at BSHF extend our deepest gratitude to Congressman Chris Smith, Senator Robert Menendez and their wonderful teams. We would have never reached this milestone without their tremendous efforts and ongoing dedication to this cause. 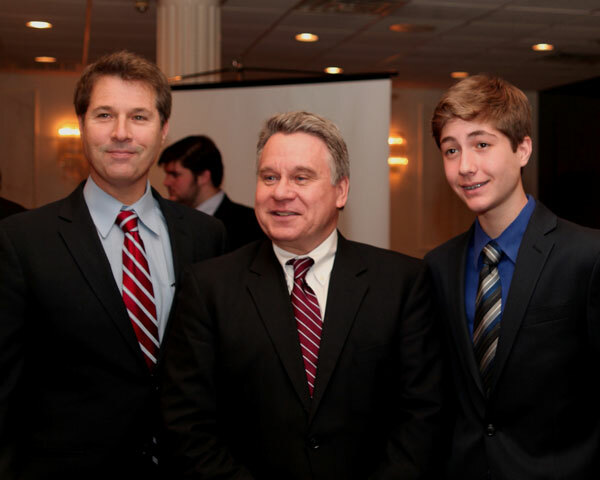 PICTURED: David Goldman, Congressman Chris Smith, and Sean Goldman. WASHINGTON, Aug 9 — Thousands of American families struggling on very different fronts will received federal support now that President Obama has signed into law two separate bills late Friday, one to help prevent international child abduction and return American children now held overseas, and the other targeting $1.3 billion in federal funds to assist families touched by autism. “What a momentous day for thousands of families across America,” said Rep. Chris Smith, the author of the Sean and David Goldman International Child Abduction and Return Act (H.R. 3212) and the author of the Autism Collaboration, Accountability, Research and Support (CARES) Act (H.R. 4631). “While different in scope, these new laws have one, overriding common theme: making the federal government work better for children and families. “Yesterday, if you were a parent whose American child was abducted to a foreign land, the State Department took a step back and quickly outlined the limitations on what it would do to help,” Smith said. “With the enactment of the ‘Goldman Act’ that policy changes. The State Department gets new tools to effectively engage the fight and work several fronts to get our children back,” Smith said. Smith’s Autism Collaboration, Accountability, Research and Support Act, The Autism CARES Act, builds on Smith’s long established record of assisting the now 1-68 children who have been identified with an autism spectrum disorder (ASD). According to the latest CDC data released in March, New Jersey has the highest prevalence rate in the nation, with one in 45 children identified as having ASD. “The Autism CARES Act authorizes $1.3 billion over five years to continue the critical pipeline of federal research dollars that are working to identify best practices for early intervention, treatment and care for families touched by autism,” said Smith who has authored previous legislation that has helped form the base line of federal autism programs. “And the new law, for the first time, tasks the federal government with examining and anticipating needs for autistic adolescents who are ‘aging out’ of their school-based support and transitioning into adulthood,” he said. Last month Smith held a congressional hearing that delved into successful corporate programs designed to employ persons with ASD worldwide. He said every year 50,000 youths with autism enter into adulthood and communities that are unprepared to meet their need. The federal government can and must play a role in identifying new ways to assist people with ASD in our communities. Smith said both laws were inspired by the love, work and tenacity of local parents fighting for their children. The child abduction law is named after David Goldman and his son Sean of Monmouth County, N.J. who were separated for over five years after an international abduction to Brazil. Smith traveled to Brazil with David Goldman twice to help bring Sean home in 2009. Goldman now works to help other left behind parents reunite with their children. Regarding the Autism CARES Act, Smith credited Bobbie and Billy Gallagher of Ocean County, N.J.–the parents of two small children with autism who visited his office 17 years ago. Using their own extensive research, the Gallaghers demonstrated how far behind the federal research agencies were in their understanding and work on autism. “The Gallaghers are pioneers in the effort to find better treatment and interventions for children with autism. Together with other parents they have been tenacious in their efforts to see this bill passed into law,” Smith said. “The laws we have today to help families with autism would not be on the books were it not for them,” he said. AUGUST 9, 2014 — The last time Bindu Philips saw her twin boys was in 2012 when she traveled to India for a mediation hearing — but only for a few minutes. For nearly six years, she has been embroiled in an international custody battle with her now ex-husband over their boys, now 13. Her ordeal could come to an end soon after President Obama signed into law Friday legislation that authorizes the State Department to take increasingly forceful measures against any country that does not help return an American child illegally held there. The Sean and David Goldman International Child Abduction Prevention and Return Act is inspired by a Tinton Falls father whose son was kept in Brazil by his wife and her parents for more than five years. Philips’ ex-husband, Sunil Jacob, took the family on a sudden vacation to India in December 2008. He separated the children from her and kept them from seeing her parents. After three weeks, he enrolled them in a school without her knowledge. The principal let her talk with them twice a week, but when Jacob learned of this, he transferred them to another school. She returned home to the U.S. after a few months and has continued to fight for them ever since. He denies her all contact; efforts to send them messages and motherly advice via a website were shut down by an Indian court order. The thought that she could finally be reunited with them gives her a renewed energy to face each day. AUGUST 10, 2014 — President Obama has signed into law a bill designed to thwart international child abduction and help return American children now held by estranged spouses overseas, according to an announcement by the measure’s sponsor in the House of Representatives. Smith’s office also announced the signing of another bill he sponsored that would target $1.3 billion in federal funds to assist families touched by autism. The two bills, signed Friday night, received bipartisan support and were sponsored in the Senate by Robert Menendez, D-Paramus. The child-abduction law would help parents whose children have been illegally taken abroad by former spouses, allowing the State Department to act on the issue and in some cases to impose economic sanctions by withholding aid. The bill was prompted by the case of Tinton Falls resident David Goldman, whose wife abducted their 4-year-old son, Sean, and took him to Brazil. Sean was returned by Brazilian courts in December 2009, more than five years after he was abducted and years after his mother died. So-called left-behind parents have spent years seeking federal intervention and trying to get people to understand that these are not custody battles but rather violations of American law. More than 90 nations have signed the Hague Convention, which is supposed to uphold court-ordered custody provisions. The new law would cover nations that are not part of the Hague Convention and give the State Department additional tools for those that are but are not complying with custody arrangements made in the U.S. The law requires annual reports to determine which nations are not complying, and it allows for punishing them by delaying or canceling state visits and limiting or eliminating various forms of economic assistance. It also allows for the U.S. to make extradition requests. The Autism Collaboration, Accountability, Research and Support Act — or the Autism CARES Act — authorizes $1.3 billion over five years for federal research to identify best practices for early intervention, treatment and care for families touched by the disorder, Smith said. The measure involves the federal government in “anticipating the needs” of autistic adolescents who are “aging out” of school-based support programs.